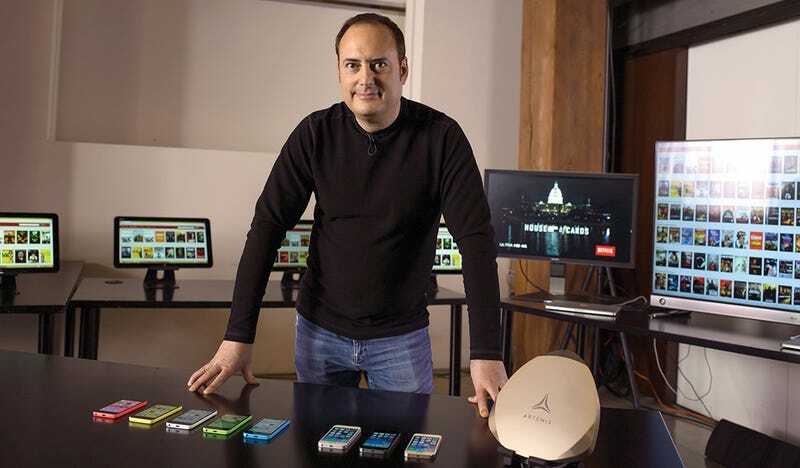 Dish wants to be a mobile phone carrier. Dish wants it bad. And Steve Perlman—the genius behind QuickTime, WebTV and OnLive—has spent over a decade working on tech that could allegedly leapfrog our current cell networks. So guess who just teamed up to potentially revolutionize the mobile internet? Yep. Dish just agreed to lease some of its substantial new wireless spectrum to Artemis Networks, the company that Perlman created to commercialize the so-called "pCell" technology. And with that spectrum, Artemis plans to blanket San Francisco with some crazy-fast, crazy-efficient mobile data. As soon as it can get FCC approval, anyways. What's so great about pCell, anyhow? It's pretty simple: Where existing cellular networks have to be spaced out to avoid interference, leaving dead zones between them and slow speeds on the edges of each cell tower's domain, pCell claims to actually take advantage of interference by intelligently overlapping wireless signals, creating localized pockets of signal right at your smartphone's antenna. As each phone broadcasts its location, the pCell network figures out what combination of signals the pCell antennas need to transmit in order to add up to a stable connection. How does it do all this? That's a way more complicated question, and one whose answer requires a 99-page white paper to explain. But as far as you or I are concerned, it could be as simple as sticking new SIM cards into our existing phones and suddenly having amazing signal and speeds. You see, pCell apparently works with existing LTE technology, so nothing needs to be modified on the phone. All the work happens on the mobile carrier side of things. As long as you've got an iPhone 6, iPhone 6 Plus or compatible Android handset, you should be able to give it a go. But probably not for long, because Perlman says Artemis Networks doesn't plan to be a mobile carrier itself. The company's looking to get existing mobile carriers interested, and this SF trial is designed to show the skeptics that the tech can really work. Perlman actually introduced the idea four years ago under the name DIDO, but it didn't take off. If this time is different, it'll probably get licensed to an AT&T or Verizon or T-Mobile... or maybe even Dish. Who knows.